For all of this week I have lived and worked at a disadvantage, disregarding symptoms for the sake of getting things done. A cold caught from a family member has taken hold, even as I wrestled the wire into shape – even as I prepared and sent off samples of writing for an authors conference that will take place the same weekend as The Peter Anderson Festival. I’ve accomplished much while my body stressed, suffered, and cried out for mercy. Yesterday, I registered for the Ocean Springs Art Association exhibit, standing in line, awkwardly gripping a drawing under one arm while holding – as carefully as possible – the most recent angel with her stand. It was humid and hot with an ineffectual breeze wafting through. My body’s response to the stress of the situation was to sweat profusely. The angel trembled nervously in my hands. By the time I had filled out the necessary forms, and someone had placed her on a pedestal close to my father’s muraled walls, her balance was definitely off. She swung out oddly – her back to the crowd, as though she was desperate to fly out of that room. I ignored a nice woman’s remarks that all would be well, and went to the lopsided child of my hands. I soothed her and worked with her malleable substance until some semblance of her original gesture was achieved, then left reluctantly – my heart hurting, my body protesting such a desertion. I was ready for distraction. When SD – an old friend not seen in a very long while – came rushing toward me, I yielded gratefully to a visit. Her generous spirit seemed to be just what I needed. We spoke of our respective passions for European cities: hers for Florence and mine for Paris, spoke of meandering anonymously on ancient streets, absorbing old world beauty and charm, belonging there. We talked, laughed, and empathized, oblivious of all the busy artists around us. We let go and summoned the vital self. I told her of my “Lily” story: the alternate life explored and realized through writing, and she told me of reconstructing her life after losing everything in Katrina, her attempts at moving to Florence, then surrendering to living here in a lovely old cottage, converting the garage to an art studio, and painting again. It was good to lose myself in this way, to swim in realities that are frequently set aside for the purpose of getting on with life – good to indulge with a dear old friend, even if afterwards I was weary and slightly deflated. Even so, I remembered her last words to me – called out as I walked away. Don’t forget Goethe’s words: “Life rewards daring.” Through the rest of the day, I remembered them often, as my cold symptoms made themselves known again, and I sank with exhaustion. My body is definitely lagging right now, but I know there is some secret movement of the spirit taking place. Somewhere in there, I know myself as a brave angel. Thank heaven for meetings with other angels who share this knowledge. Play is not always easy. As one ages, one comes to take life pretty seriously. The urge to get things right before it’s too late can get in the way of the urge to play. Gravity can overwhelm the lovely levity of childhood. Thankfully, when one enters the zone of creativity – even with serious intent – the child within is invited to play again. Pressed to work with the wire again – that I might have some pieces ready for The Peter Anderson Festival in early November, I forced myself to begin the struggling sort of dance that creating with wire entails. I began with the idea of making a smaller more child-like angel. I wasn’t sure why, and almost regretted it due to the difficulty of shaping the wire into smaller forms. But I persevered, stubbornly disregarding the punishment to my hands. My fingers squeezed and pushed and resorted to needle-nose pliers until at last she was finished. However, she wasn’t complete. What to do with her next. She simply couldn’t stand alone. 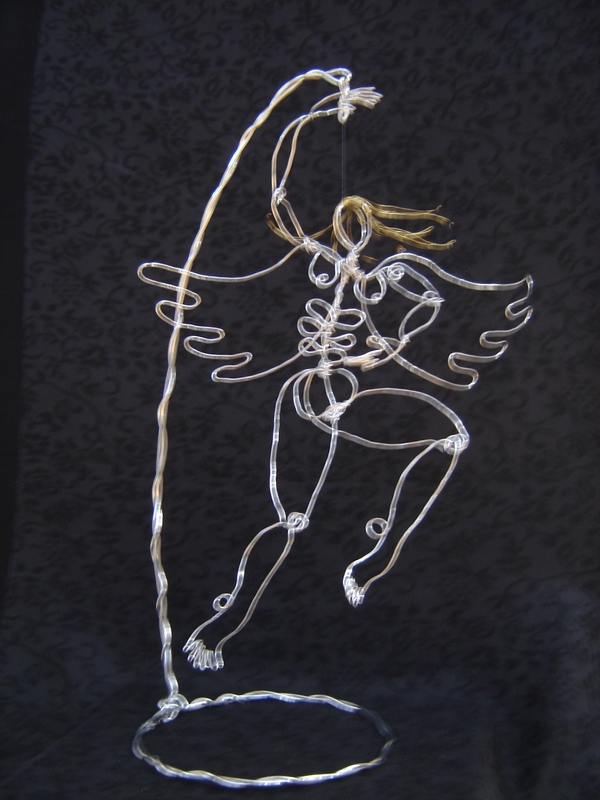 She lay around for a couple of days – while I did some remedial work on another angel. Then I accepted her need for a companion and created a little winged dog. This was smaller and even more difficult than the child angel; I came close to giving up. He seemed awkward at first but the simple act of adding two ears and a tail out of gold wire gave him a lively doggy air. Now I knew there was something playful going on, but I needed something to unite the angel dog with the angel child. A tiny circlet of gold: a ball. 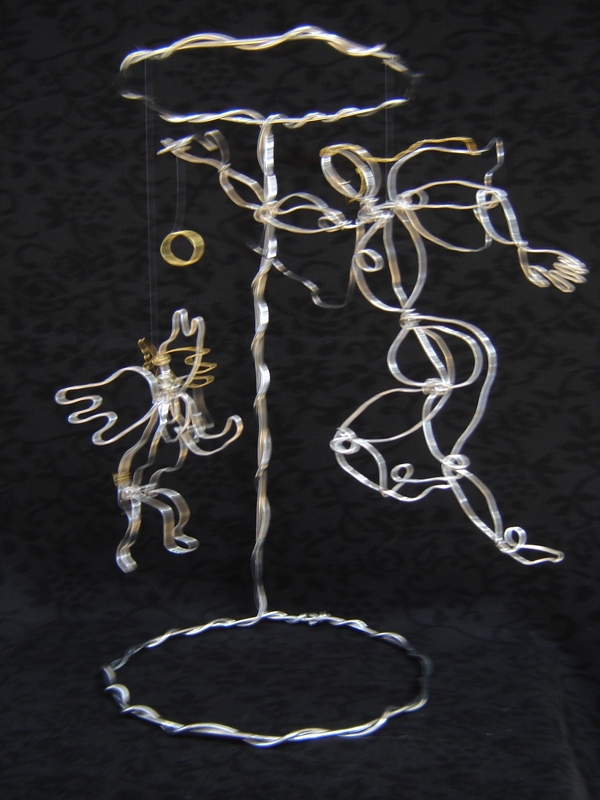 Next I made a stand out of heavier gauge wire – to suspend them from and allow them to play. Nearly invisable fishing line attached them, the tiny gold “ball” was hung from the hand of the child. Remarkably, a balance was achieved and I stood back to watch them – turning, moving subtly in response to the overhead fans in the room. My work was done; my creation could play. And I found that I had been playing all the time. My blessing of a grandchild had no interest in entering the fray of “Cruzin the Coast”. 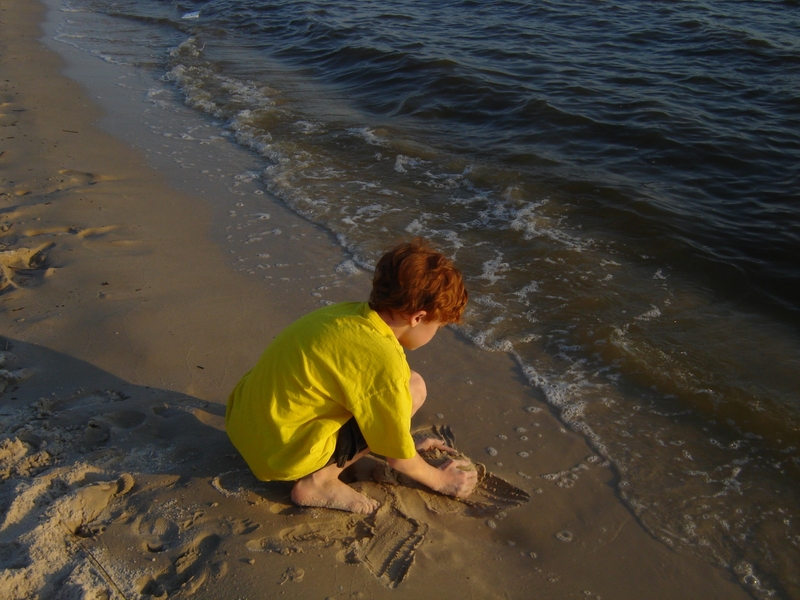 He preferred to go to east beach and immerse himself in the glory of sand and water. While his older sister was hanging out at a friend’s house, he and I basked in the warm/cool air of early fall. He was industrious in his basking, scooping and carrying wet sand and patiently building a fort. When I said we must leave to feed my Sunny cat and pick up his sister, he suffered for all of five seconds, then backed up and took a flying leap into the midst of the fort he had laboured over. Sand flew and he laughed out loud at the pleasure of letting go. As we drove away he must have thanked me ten times for taking him to the beach. The Goddess must have been feeling extremely generous, for on the way down Hudson, we spotted two foxes, and at a safe distance, a rabbit munching happily on grasses. My young lover of all creatures was overjoyed, as was I. For several days I am staying at my daughter’s house with her two children and four cats. She is having a getaway, and I am in grandmother mode. I do not feel like writing, but a tiny part of me hopes that going through the motions of imparting something readable will raise the writerly impulse. The children have reached ages that don’t require constant attention; at ten and fourteen, they have their interests and occupations. I am mostly cook and chauffeur. Only occasionally am I called upon to relieve someone else’s boredom, and that is usually one or the other of the cats. Let me out, pet me, let me in, top off my food, please…………………. do something about the litterbox. The oldest and most dignified of the cats is asleep in the chair I am now perched upon. I just couldn’t bring myself to remove her simply for the sake of my own comfort. Besides, perching keeps me more alert. Drowsiness – leftover from spending last night with the overly affectionate Mr. Pibb – is counteracted somewhat by my precarious position and upright posture. You see… I can almost laugh at my current situation. For all of my growing up years, I watched my father make frequent getaways to his chosen haven: Horn Island. Lately I contemplate this practice as a means of maintaining his sanity. His cottage on the family compound allowed connection with his family and all that represented, yet his island getaway insured connection with himself. Free from demands – imagined or otherwise – he was free to exist in his natural and unencumbered state. Horn Island was his paradise; trees, sand, wind and wave, birds, butterflies and curious and charming mammals were his daily bread. His drawings and watercolors were means of manifesting love. 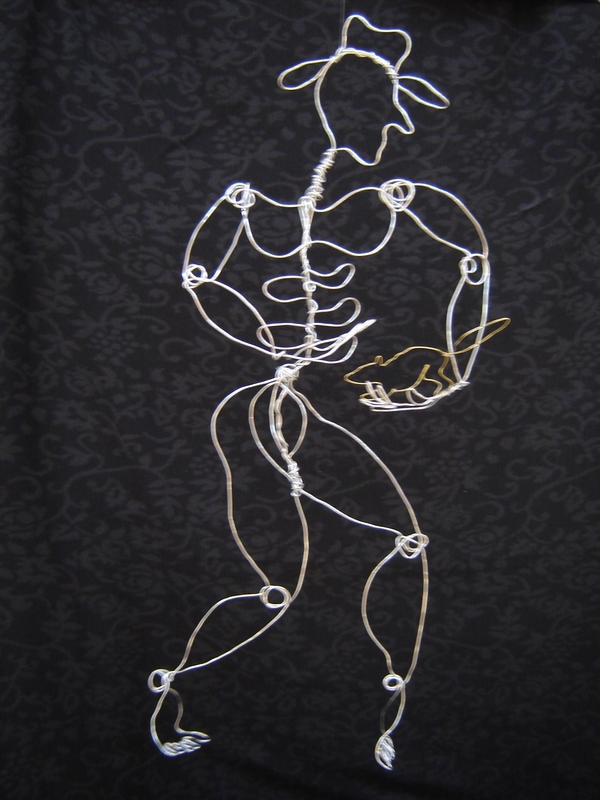 My recent wire creation of my father seems to speak to me of his capacity for love. He holds protectively a baby racoon, possibly taking it somewhere to set it free. I never knew this aspect of my father while he lived. He was barely present during my growing up years, and his infrequent presence was not a comfortable one. Even so, my imagination has led me to this image and allowed me to identify – somewhat cautiously – with the vulnerable creature held on his hand. Some part of me is alert to his wisdom and even his compassion. Some part of me knows he has my best interests at heart. Some part of me trusts him to carry me to where I need to be. But all of me longs for the haven where I can be free. You are currently browsing the A Dance of Balance blog archives for October, 2010.